The recent news about a Sydney man who shut down the harbour bridge for a few hours has highlighted the lengths some men will go to when confronted with parental alienation syndrome (or PAS). 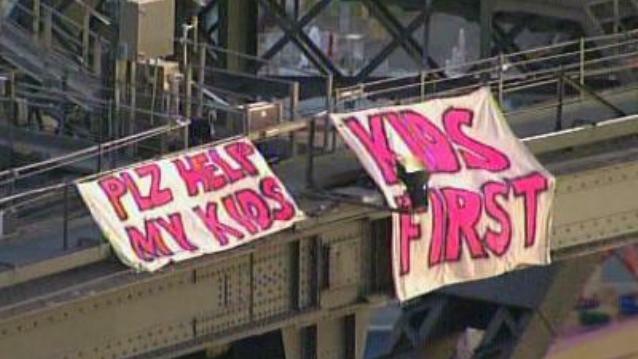 It has been reported that the man spent 4 days researching and talking to security guards on the best way to scale the harbour bridge so he could cause the largest disruption possible – just to display the banners “Kids First” and “Plz help my kids”. This is obviously a man who loves his children, would do anything for them, but at the same time feels shackled by the system. None of the details of the case have been released by the courts or the media, but you can imagine that this is a man who doesn’t know where to turn, felt helpless against what was happening and felt he needed to somehow bring attention to his situation. The term was coined by an American child psychiatrist Richard Gardner in the mid 1980’s. He defines it as “”…a disorder that arises primarily in the context of child-custody disputes. Its primary manifestation is the child’s campaign of denigration against the parent, a campaign that has no justification. The disorder results from the combination of indoctrinations by the alienating parent and the child’s own contributions to the vilification of the alienated parent”. It was originally developed as a theory to explain the increase of the number of reports of child abuse in the 1980’s. Gardner initially stated that the mother was the alienator in 90% of cases, but later stated that both parents were equally likely to alienate. Parental Alienation Syndrome doesn’t have many supporters in Australia and even the use of the term is controversial. In fact, it is often recommended that you never mention the words “Parental Alienation Syndrome” in front of a judge (if representing yourself). This is because it isn’t actually a ‘syndrome’ and the courts in Australia don’t see it as a proven problem or accept it as a valid argument in court. There was a case which resulted in psychologist William Wrigley being reprimanded by The Psychologists Board of Queensland for endorsing PAS, so don’t expect many psychologists in Australia to provide much support. In any case, your fight is to win parenting orders, not to have an intellectual battle as to whether or not PAS should be recognised by the court system. That said, it doesn’t matter what it’s called, nobody can deny that parents have the capability to brainwash a child against the other parent if they so desire. You don’t need to be an expert or to call it “PAS” to understand what’s happening. When trying to address this issue in court, what you need to do is firstly play by the rules. Even if you believe the court as well as every woman in the world is against you, you shouldn’t go off on a tangent and start accusing people (or the court!) of being ‘against you’ – even if that’s the way you feel. Doing so will make you look unbalanced and irrational. What you can do is talk about the behaviour of your child on a more fundamental level and raise your concerns about such behaviour. You can talk about the ‘alignment’ of the child – which parent the child is more closely ‘aligned’ to and you can use this description to frame your concerns. Remember that each one of the concerns that you raise needs to be linked to verifiable behaviour that you have observed – you can’t simply raise concerns with no ‘proof’. Each concern and the associated incident should also be put in an affidavit to the court. So don’t go stopping all the traffic on the harbour bridge to raise the awareness of your plight. By the way, the guy that did stop traffic on the bridge? He can’t approach his ex-wife or his kids (or the bridge!) so although he got his 15 minutes of fame on the news, he probably hurt his case more than helped with his stunt. This info seems very much aligned to the father, and therefore against the mother and her need ti look after herself and her children. What is the go with that? Hi Lisa, Although the wording in the example above is from a fathers point of view, the same advice applies for women.